I took the old Triumph T100 for an MOT today, neither mechanic would try to start the bike, is this health and safety gone mad. One did try after I started laughing, but he stood more chance of falling over or hooking it into gear if it did start. I started it up for him, but then he could not find any gears, he was trying to change gear with the rear brake. They had no idea on the switches (standard Lucas type for that year). I've done 37 miles on it in the last two years, so I was not much help. I must take a camera with me next time. I'd better not take my '52 Sunbeam S8 in there! 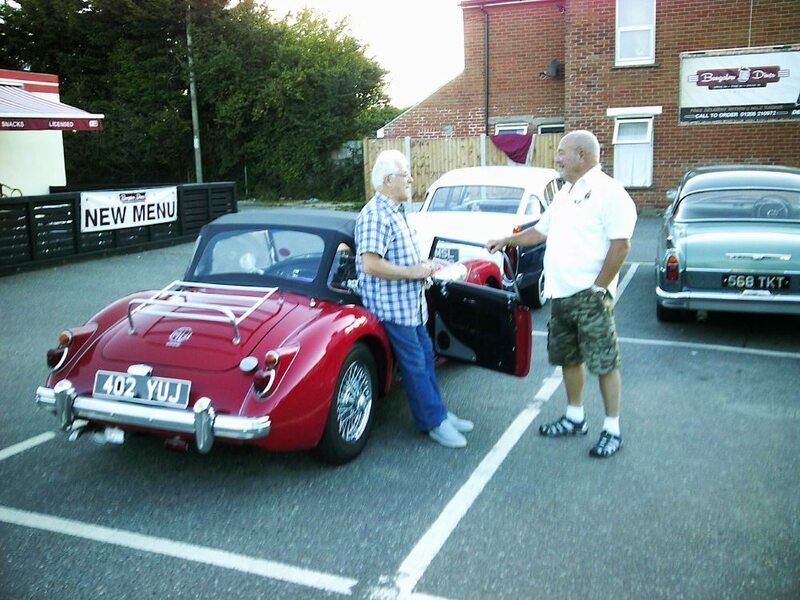 Jim, I sold the Triumph about 5 years ago, the same outfit ruined the petrol tank when he opened the petrol tank filler cap, he was wearing a ring and took the paint off. I Do you still use the Sunbeam, they were very good roadsters probably better than the the S7 with the larger tyres. I doubt whether you really need an MOT now and from your own experience its pretty pointless. If the bike is more than 40 years old you can register it as historic and self certify with an MOT exemption form. Why did he need to use the gears for an MOT? He needs to move it into the garage from outside and they did not fancy pushing it. The gearbox is not part of the test as far as I know, although its strange if its missing. FFS. The place I used to use regular when I lived in Essex, always pushed it. Only started it to check the exhausts and if it's the kind of bike where the lights will only work if engine is running. Not had to have an MOT since I moved so can't comment on the local facilities. Despite a stitch up to my knee, a couple of years back, I bought a Royal Enfield Bullit with just a kick start, which can kick back and was a b to start at first but seems better now albeit I saw yesterday there was petrol dripping down from the float chamber. I went to a vehicle show in Clacton today in my old Viva, as the forecast was for rain showers. A couple of Bikers and a woman in leathers stopped and one said this is the Viva from Dovercourt , we live just down the Crescent from you. The guy said he had a Honda 4 from the eightees and their mate had a 1961 Bathtub 3T(I think) and he used to live in Lawford where I was before, but not the guy opposite us there who had a similar Metallic blue 350. Did feel sorry for them when the heavens opened but then have plenty experience of bikes being my sole form of transport. The place there I used to take my bikes in Manningtree, lost their full time MOT tester, and quite frankly I spent a load of dosh getting my Aprilia Atlantic recommissioned (as they say)near here, mainly a lot on electrics and to be fair they did say the wiring was a botch job, not by me, and the ignition switch a cheap Jap one. That said after spending out on a rear brake Master cylinder to get one of my bigger bikes through its MOT ,which I am using Friday having agreed to be part of a sendoff for another club's member whose biker Grandad sadly passed on, so am going to Colchester Crematorium behind combo Sidecar Coffin outfit as the Grandson wanted some bikes to follow it leading the cortage. My Cagiva is Black so is fitting. I repeateed asked for a pucker bill for all that work on the Atlantic, without result, the Scooter stopped as I was manouvering through the back gate, so run destination aborted but got it going again, however last week it did the same, and if I raised a block connector the lights all came on and it started, so tried a cable tye to clear the wiring and it seemed OK,but no luck getting to find a connector for the speedo they hadnt attempted to fix, however next morning nothing. When I put one of the fuses back in the relay block connector, to the battery the lights come on then there is that wirring sound when they come on and then they all go out again. At least I did at last change the old Dash cover that would get damp inside with a new one I bought when I first got the thing. I tried a screwdriver betwixt the solonoid terminals and it turned over but obviously wouldnt fire. Despite supposedly their work being covered by a 3 month warrantee(spoken) I really do not want to go back to that dealership as it will probably be a case of you need a new ignition barrel, we did tell you and its probably over 3 months anyway,however I am at a loss to solve the dilema otherwise. Use MOT a Bike in Colchester, I've used them for the last 11 years. Yes, Martin (along with his wife Kirsty) does most of the work now, Brian still helps out usually with the MOT's. Although he's off at the mo, recovery from a heat bypass op. Always honest and never any bull. I saw that MG go through the restoration over the years. They're off Greenstead Raod now by the Tesco's/Hythe station. I went to a Funeral in Colchester yesterday on my Cagiva, as a member of The Roman Roadsters asked for volunteers to accompany the motorcycle combination carrying his Grandad's coffin. As I heard nothing assumed that the various Clubs recomended on the RR Facebook page, had responded, unfortunately it was only self and a guy on a Suzuki 800 Chopper. The Roman Roadsters are visiting Beacon Hill Fort tomorrow, then later going on to Clacton for Fish and Chips and if you are at a loose end and fancy a run over, we meet around midday there(The Fort)albeit I should be there earlier. Then Sunday is a show at Brightlingsea, and the following week one at Walton on the Naze I had to order a new gasket(in fact a whole set for £8 p&p)as the carb bowl was leaking but its coming from India so I doubt I shall be going on the Enfield Bullit. Finally sorted the electrical glitch on the Atlantic, tried a Honda barrel and key result, then it went back to lights on then off, so moving a block connector seemed to be the source of the on off power, removed that joined and soldered the connections direct and a bit of insulating tape later, starts on the key/button. So celebrated by a trip on the down to a chippy / Scampi,on the front/ having elected not to go to Clacton for such as my ankle was still painfull Saturday,after a very successfull visit to Beacon Hill by several Classic Cars,but did manage a visit to the Hythe as Essex Radio were transmitting from the Light Ship,(maybe weather permitting take the Aprilia Scoot next time to their Official Meet) then on to Brightlingsea in the Viva. Lots of bikes and a ferw Scooters with kick starts.